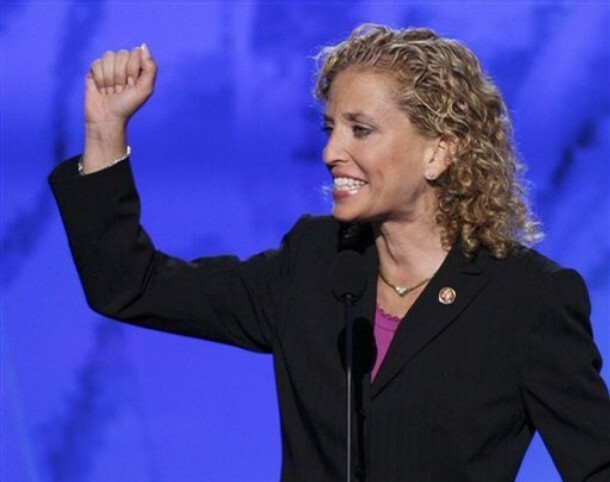 Barack Obama’s hand-picked head of the Democratic National Committee is one Debbie Wasserman Schultz. Rep. Schultz is perhaps best known, courtesy of Rush Limbaugh, by the handle Debbie Blabbermouth Schultz. She specializes in smarmy demagoguery that faithfully toes the party line, reducing it to its essence. It’s why Obama loves her. “Look, Debbie” Rep. West instructed, “If you have something to say to me, stop being a coward and say it to my face, otherwise, shut the heck up. Focus on your own congressional district!” Notice the gentlemanly use of “heck” when Rep. West clearly had another, more offensive word in mind. The terms of Rep. West’s condemnation of Schultz are a bit out of fashion. Schultz is a Democratic Party attack dog. She no more aspires to ladylike behavior than does Rep. West. She could serve to update the joke: That’s no lady — that’s the head of the DNC! Wasserman Schultz later conceded: “Jim Crow was the wrong analogy to use.” She only meant to say the same thing in other words. Indeed, in her pseudo-apologetic statement, she reiterated her point: “But I don’t regret calling attention to the efforts in a number of states with Republican dominated legislatures, including Florida, to restrict access to the ballot box for all kinds of voters, but particularly young voters, African Americans and Hispanic Americans.” But I digress. Rep. West’s condemnation of Schultz were brought to our attention in a “Dear Hind” email from Democratic Congressional Campaign Committee chairman Rep. Steve Israel. Rep. Israel was up in arms, sort of: “We can’t let this shameful display go unanswered.” What answer did Rep. Israel propose: “Contribute $3 or more right now. . .” The Hill picks up the illuminating fundraising thread this morning. Say what you will about Rep. Israel, I think he set the price of the offense just about right.